i love glitter! 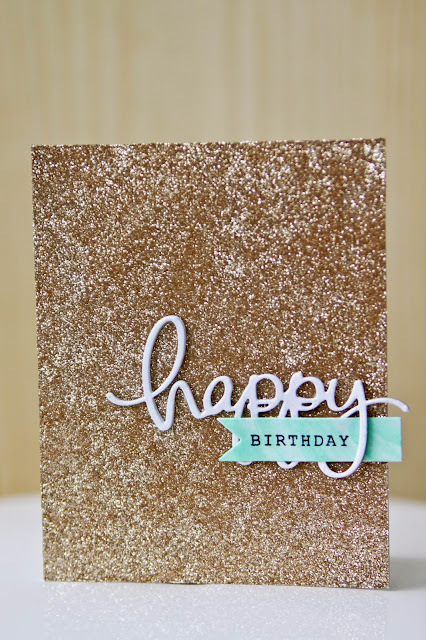 so i've been wanting to create a card that was super glittery and my sweet friend tammy t's birthday was the perfect occasion because she's pretty darn sparkly! i started with an all-over glitter base. then i die cut "happy" 4 times and adhered all of the layers together. i added a little extra shimmer to the top of my dimensional "happy" with a clear wink of stella pen. finally i watercolored a little banner and stamped it with "birthday". You know this my favorite! What a knock out card!